Unassuming as it is, the Subaru Impreza is one of those models etched into the history of automotive sport, and of course it benefits from the renown of the brand and all the good baggage that brings. If today the little Subaru is reaching new sales heights, it’s not just because of its performance in terms of energy efficiency, safety and all-weather excellence. The fact is this sedan has very few direct competitors on the market. 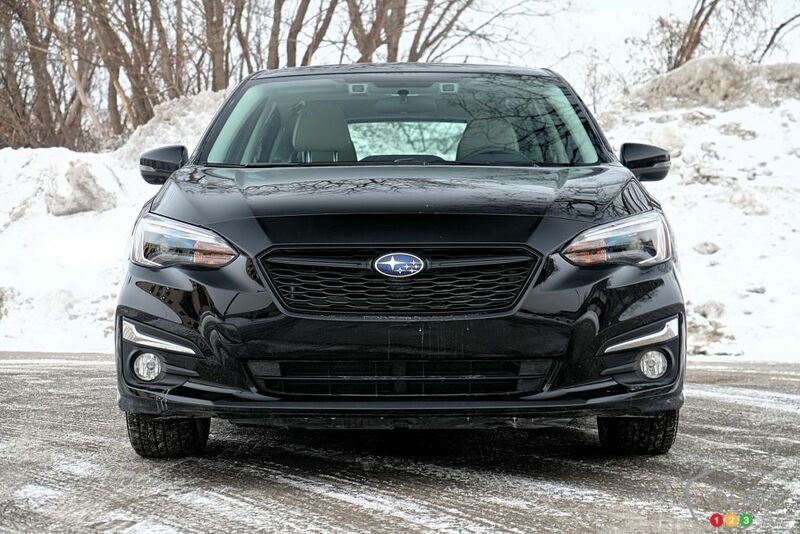 For the price, it’s simply impossible to find an AWD car on the market that rivals the Impreza. 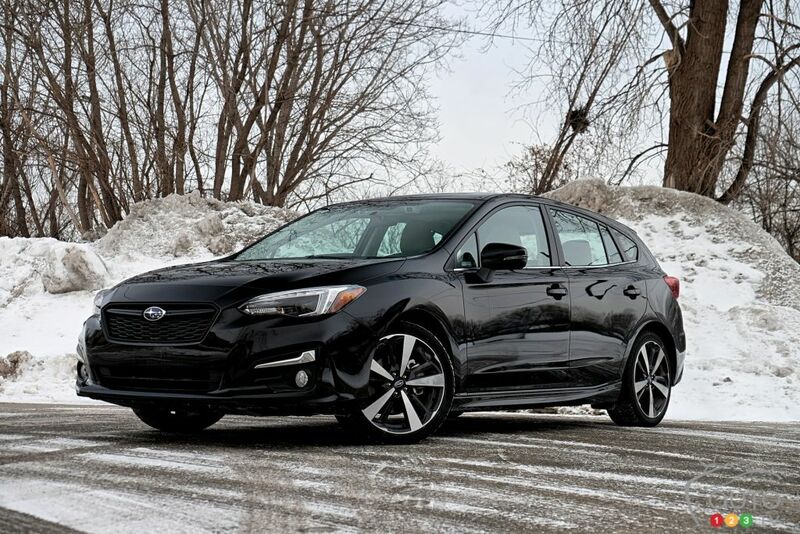 In fact, check out our latest ranking of the Top 10 most affordable vehicles with all-wheel drive in Canada, and see where the Impreza ranks! For 2019 the Impreza comes in four distinct flavours: Convenience, Touring, Sport and Sport-Tech; we were given the latter of those versions to romp around in in the snow, equipped with the excellent EyeSight package. While there’s no denying the Impreza of today is considerably different from the model’s first generations, Subaru’s qualification of its 2019 edition as “daring” is stretching things just a bit. There’s no radical departure from its styling past here, but the new Impreza’s look is pleasant and well-proportioned; you can even call it elegant. 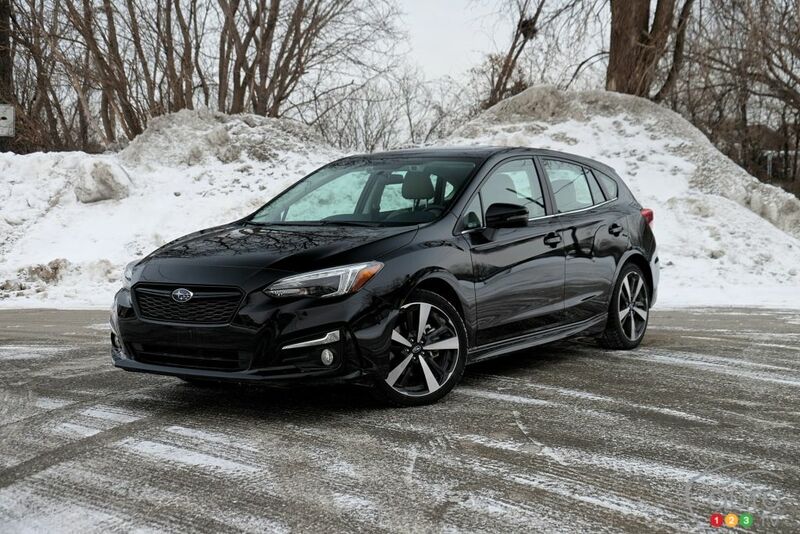 The Sport-Tech version of the 2019 Impreza comes shod in 18-inch wheels, which does alter the appearance a little bit, adding a bit of muscle and ground clearance. The Convenience and Touring versions get 16-inch wheels, while the Sport gets 17-inch wheels. There’s also a welcome power sunroof to add a bit more flair. A vibrant new colour has been added to the menu for 2019, Island Blue Pearl. The Sport-Tech version can also be had in Crimson Red Pearl for those who want to draw more attention to themselves. The ivory-coloured interior (available on all trims save the Convenience) brings another level of pseudo-luxury to the car; other choices are black or beige cloth seating and accents. Overall, you have to salute the level of finishing throughout the interior of the 2019 Impreza. You could argue that the superposition of the screens makes for a busy space between the front seats, but I rather like that top horizontal screen that provides most of the data I want to access periodically, so that I don’t have to wade into the menu of the bigger screen below. Otherwise, various little details like the stitching on the seats do their part to beautify the interior space. The Sport-Tech version, by the way, makes the readouts on the instrument cluster in front of the driver appear in fiery red, a nice little touch if you just go with the slight kitschiness of it. The seats are comfortable and adapt well to different passengers. Surprisingly, the rather compact exterior of the Impreza doesn’t translate into a cramped interior. The car can look rather puny when standing next to any other Subaru, even the Legacy, but the cabin is spacious and the rear offers sufficient room for its occupants to be comfortable, while the trunk can handle a decent combination of luggage, hockey and golf bags and what-not. The back seats, moreover, fold down flat to provide a large cargo area, easily accessible via the hatch opening and low sill point. There a few minor exceptions to the generally high quality of materials overall, a reminder that some compromises were unavoidable in order to keep down the selling price of this AWD sedan. There's some iffy plastic placed here and there and the carpeting seems a little bargain-basement, for example, and seems more appropriate for the trunk than for the passenger space. The straightforward simplicity of the Impreza’s commands inside is commendable; big buttons and a large 8-inch touchscreen make for easy and practical navigating. (Take note that the Convenience and Touring versions make do with a 6.5-inch screen). The integrated GPS provides real-time info on traffic conditions. For 2019, Subaru has fitted its Impreza with an improved infotainment interface, and Apple Carplay and Android Auto compatibility is included across the product range. There’s also a premium harmon/kardon audio system with 8 speakers. Now for that EyeSight package. It includes a suite of safety functions, and the system is designed to intervene intelligently when needed. The system has been proven to reduce the risk of accident – take note that the NHTSA gave the 2019 Impreza its highest-possible Tops Safety Pick+ rating. The package includes features like a backup camera, adaptive cruise control, lane keep assist and automatic braking in emergency situations, including when in reverse. You also get a smart key with push-button start. In my view the total of features included is on a par with what you’d generally find in costlier models. 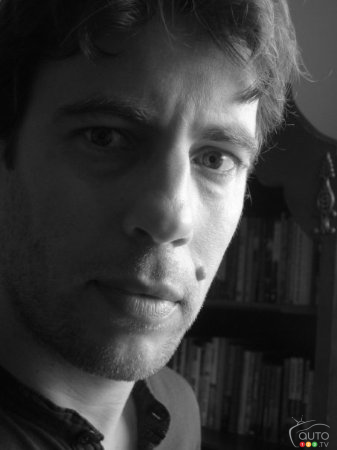 The EyeSight package is therefore a high-value proposition. The 2019 Impreza Sport-Tech comes with a 2.0L 4-cylinder engine with direct injection and an output of 152 hp. The first three trims of the model can be had with a 5-speed manual transmission, which is unusual these days. Alternatively the Sport-Tech comes by default with a 7-speed CVT. Maximum torque for this Impreza is 145 lb-ft at 4,000 RPM, and official fuel consumption is 9.0L/100 km, which is fairly attractive. That said, my test week took place during a cold, snowy spell, and I did not better than 11.6L/100 km. To be fair, I drove it primarily in the city, but still, those consumers who are looking to minimize what they spend on gas may find this is not the ideal choice for them. All-wheel drive is great and all, but it requires accepting a more fuel-hungry daily-driving experience. Given those sporty accoutrements, I did expect a slightly more lively time behind the wheel of this high-end Impreza. Acceleration is simply ordinary, no matter how much I played with the gas pedal to try to coddle the CVT. This powertrain could use more torque. On the other hand, nothing much to fault about the steering, it’s light in the hand without being jumpy in reacting to commands. The suspension is also quite accomplished, despite the extra firmness it imposes on the butts in the seats. It’s more than able to handle the challenges thrown at it by our wintry Canadian roads. It’s worth noting that the new Impreza benefits from a stiffer body than before, and it shows. The car is quite adept on corners and in those situations, it truly is rather sporty. As mentioned, there are few direct rivals the Impreza can be compared with on an apples-to-apples basis. This is a smallish sedan that’s well adapted to the urban environment thanks to its size and handling agility, but is generous with its interior space. Meanwhile the all-wheel-drive system is excellent and you can get it here for quite a bit less than just about anywhere else. You could consider the Volkswagen Jetta, which delivers livelier driving dynamics. But in addition to that AWD, the Impreza actually has more basic power at its disposal. 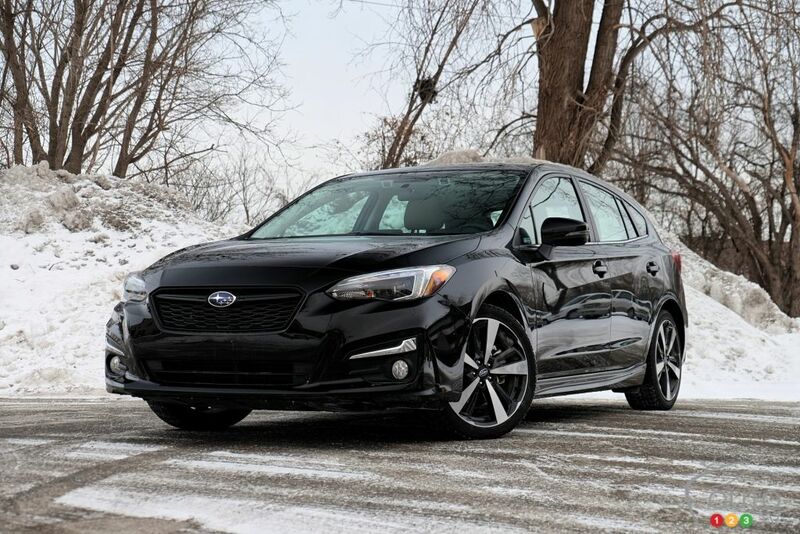 The starting price for the 4-door Convenience version of the Impreza is a an attractive $19,995, and it climbs from there to $31,095 for the 5-door Sport Tech with EyeSight package. The 2019 edition of the Impreza is a model at maturity, with self-confident, no-flash looks, and it’s very good at what it does best. It’s come a long way in the last dozen years, although you could argue that the driving sensations offered by those earlier Imprezas were more stirring than today’s model. The lack of engine power, especially in the base models, could dissuade some potential buyers. 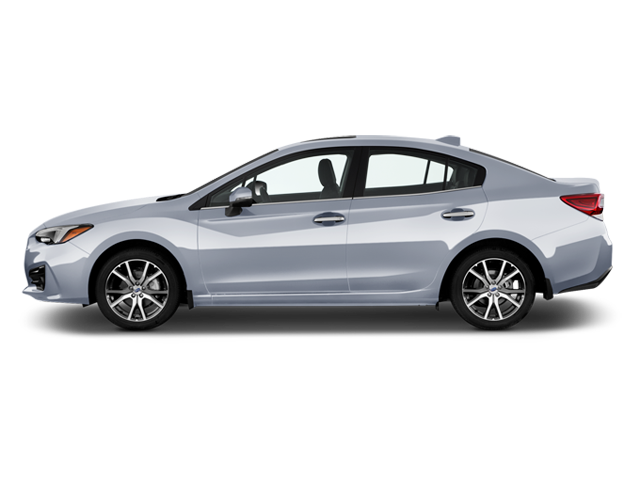 But if you’re looking for a solid all-wheel-drive vehicle at an affordable price, the Impreza’s for you.